It was a life or death situation. Isaiah had found out that he was a rare bone marrow match for his little brother Elijah, then five years-old. This would be a chance to save Elijah's life. Without hesitation the 14 year old jumped-in to save his drowning brother. Three years earlier, his 13 year old sister, Essence, had died from the same disease that was trying to pull Elijah under too. But, not to be; Elijah has now been cured of Sickle Cell Anemia by Isaiah's gift of life. We find the valor of Isaiah to be awe inspiring. It is time this young man has a room for hope and happiness. A place designed by him to express goals and dreams of a bright future. Will he become a doctor, politician, or engineer? These are all on his radar. I have been personally assisting Isaiah in the creation of his space. He has deep sensitivity and artistry of spirit. His room will be insightful, modern and in good taste. His color palette is earthy yet retro: leaf green, chocolate brown, teal, saffron, tangerine and white. So far, he leans toward mid-century furniture silhouettes and edits decisively. Today, Josh Jett, left, of Home Delivery Service KC, assisted Isaiah, right, and myself, in assembling the FLOR area rug. The modular carpet tiles allowed Isaiah to customize the colors, design and size. The rug is the color "hub" for the new room. Josh references the FLOR website on his I-Phone for installation instructions. Stay tuned for the video reveal to see the final product.
" This is a new start. I am very grateful to Design Gives Back for this opportunity to define my life and world. For years, I have felt just caught up in events. It felt like the old things in my room were keeping me in the past. I needed to cleanse my mind and space. I get to choose what happens here," said Isaiah. DCM Construction Company of Kansas City, Missouri is led by the noble Rick Bright. When Bright, below left, heard that a brother US Marine's family was struggling with the congenital disease of Sickle Cell Anemia, he volunteered the services of his talented craftsmen to help Design Gives Back create two dream bedrooms. Elijah and Isaiah D. are the recipients of the Miracle Makeover now in-progress. Because Elijah has had complications due to a bone marrow transplant that have devastated his stomach and caused ongoing health concerns, we have endeavored to use the most hygienic and non-toxic materials in the installation. Jesper Nielsen, right, of DCM Construction spent three days of the past week installing a low VOC engineered wood floor by Mullican. DCM's crew will continue to help with carpentry throughout the project. We are honored to share this project space with Bright and all of his DCM Construction "Knights in Shining Tool-belts." Who Is at Risk for Sickle Cell Disease? Anyone who has suffered with health issues knows that keeping the immune system strong by limiting exposure to chemicals and germs is a must. In our upcoming Miracle Makeover Elijah's room will be painted with Sherwin Williams' ProMar 200. It is a zero VOC (volatile organic compounds) product that does not "off gas" dangerous chemicals into the environment. Not only does Sherwin Williams care about our health, but, they also just simply care. This company with heart is providing all of the paint for the Daniel Family makeover. Jonathan Nelson, right, of the Kansas City, Missouri, Wornall location, models ProMar 200. Thank-you to store manager Casey Carey, and the Sherwin Williams Paint Company for your ongoing support of Design Gives Back projects. We love you! The work on Elijah and Isaiah's Miracle Makeover has started! Design Gives Back projects are all about team work. Since this makeover is in the Kansas City area we asked some of our good friends and design - related associates to join us in the joy of working together to provide rooms for hope, health and happiness. Jacob Rueschhoff and Matt Groves are two of the best white glove furniture delivery guys around. On client installations I am always comfortable with their professionalism and handling of fine furniture. Back at the warehouse, shown left to right, Jeff Groves, owner Jason Rueschhoff and Josh Jett take care of booking, assembly and related services. The crew at Home Delivery Service KC has my undying loyalty because, yes, they are great at what they do -- but, mostly for their generosity and kindness. They have agreed to do all furniture receiving, assembly ( a real chore) and installation for this Miracle Makeover. Now, that is knowing how to deliver. Try and imagine living your life in a hospital room. Then, think of not eating a meal for three years: no ice cream, no french fries, no gummy worms or chicken tenders. The comfort foods that most 8 year olds love - when sick -- being completely out of reach. Little Elijah has lived this life until very recently. The Backstory: Jesse and his wife Nakia lost their 13 year old daughter, Essence, to Sickle-Cell Anemia six years ago. Their youngest son Elijah, age 8, has lived at Children's Mercy Hospital for the past several years in a constant fight for his life with the same disease. Their middle son, Isaiah, gave his brother bone marrow for a transplant three years ago. Elijah's body then developed complications and caused greater suffering for him and the family. Now, Elijah is in remission and can go home for the first time. He has never had a bedroom of his own. Isaiah, his brother, has been living in a toddler room even though he is now a teenager, since his sister died. For the family, grief had stopped the passing of time, that is until now. Design Gives Back will provide the family with two rooms for these brave brothers that have endured so much. In August, life will take a happy turn for the family as our sponsors and crew design their dreams into a reality. Since Elijah was unable to eat for three years while in the hospital, he now loves food and wants to be a chef when he grows-up. We will make a small restaurant area in his room. He loves Ninja Turtles too and says "they will dine on pizza in my restaurant"....find him in his Ninja mask posted here. His cheeks are plump from steroid medicine, making him extra cute and his smile melts many hearts. Stay tuned for another inspiring makeover from our kind designers, craftspeople, volunteers, and corporate sponsors. It will make you believe that there is goodness in this world, I promise. Some things in life are just " meant to be." That was true of my relationship with Gloria Hamilton, one of the dearest friends, and a most faithful Habitat for Humanity volunteer. Gloria recently left us for that celestial plane, to take her place near Habitat for Humanity founder Millard Fuller, Dr. Martin Luther King, and other revolutionary lights, now departed. As a gifted public speaker, Gloria could bring down the house with the best of them; I have "God-bumps" as I write this, thinking back to her spirit-fueled talks that often garnered standing ovations. As a volunteer leader, Gloria was there for me without fail, over 100 days in the first year alone. She could have asked much, expected much...because she gave much. Gloria never pined for rewards, always just giving more, and, sometimes even bringing one of her amazing pecan pies. In the volunteering world, it is said that the purest hearts ask the very least. Based on that maxim, she was an alchemist's ideal gold. Gloria Hamilton, with great-grandaughter Jasmine. Read about their project here. As part of the Habitat family of homeowners and community volunteers, Gloria became a member of our traveling troupe, spreading the word far-and-wide about the power of creativity to transform homes and hearts. One day, in the summer of 2000, Gloria and I sat talking in a cabin room (we were to provide a keynote address that evening for 600 Habitat staffers) in Rocky Mountain National Park. Looking up at a very tall peak, we shared a revelation, grabbing each other's hands and proclaiming simultaneously " we are almost to the top of the mountain!" Of course, referring to Dr. King's famous words. I am so grateful that just a few years later, indeed, the election of President Barack Obama, proved us right. And, "Glo" lived to see it. Like many African American women of her generation, she had lived through a whole lot. "I had come full circle – from my own humble start to a successful interior designer of 15 years. And, it was time to give back. I held an estate sale, selling my worldly goods to fund the start-up project, working more than full-time, for a few years, without income. Later, we found help from the Catholic Campaign for Human Development, and in the short term the volunteers, too, were generous and charitable. The "House of Belief" DIY workshops for Habitat for Humanity helped homeowners to have the furnishings, window coverings and amenities to make their Habitat house into a true home. I knew the empowerment that would result from the DIY philosophy. It had changed my own life. When you see that you have the creativity to hand-make a home for yourself -- and your family, you begin to believe in the potential to have the life of your dreams. One action of creativity creates more belief. Seeing is believing. A "House of Belief" becomes a source of personal and family inspiration. A visual reminder that creativity is our gift from the source that created us; a Divine heriditary substance that powers the spirit." Creative Solutions: A salvaged fireplace mantel became a working fountain; a mosaic with our create-believe ideal was embedded in the wall; a crude concrete floor was painted with rock shards and poetry; castoff two-by-fours were turned into a primitive bluewainscoting; three-dollar thrift-store shutters were refinished for the window; a sisal rug was striped with island colors; and canvas for cushions was handpainted with personal symbols for the sofa. A Miracle Makeover: We were given an abandoned drug-house to remake. The drug users had left remnants of their lives inside: family photos and once-cherished belongings. The very concrete had cracked, an apt metaphor for the decay of it's inhabitants. It needed a miracle. And so did we.....some needed a bigger vision of life. I asked the homeowners: "If you could travel anywhere, where would you go?" Many answered with excitement: "The islands!" Our journey of belief had begun. We set out to create a visual affirmation of their dream, a Caribbean cottage complete with a sandy beach-like front yard. I invited 10 volunteer artists and designers to help me conduct workshops. That became 20 or 30 very quickly. Dozens gathered from throughout the city and helped in every way. Millard and Linda Fuller, Habitat's founders, came to see the house and loved the project. They wanted me to share it nationwide. I traveled with Gloria and others, presenting keynote talks, workshops and demonstrations about the project. Habitat affiliate volunteers from Fresno, California; Knoxville, Tennessee; Muskogee, Oklahoma; New Orleans, Louisiana; and many others attended a successful national training event, too. In all, more than 2,500 participated over three years, nationwide. Color Courage: The color scheme for the living room was formed from the workshop question: If you could name a color to describe you, what would it be and why? The colors were then woven together to create the color scheme for the space. Each participant was represented by their designated color. Need color courage?A recent study of the happiest places in the world reveals that colorful cultures like those of Guatamala and India are happier than more affluent, beige-loving locales. Try thrifting, repurposing, and your favorite bright colors for a lift. When you spend little for the materials it is easier to try something bold. Financial risk can become a barrier to color courage. Repurposing provides a safety net, with less of a monetary commitment. Island Dreams: Habitat homeowner Janice Busbee sewed her first curtains and valance cut from a Hawaiian shirt. Pillows painted with scenes from the dreams of the homeowners here, to play music – and a thrift bookcase fitted with picture doors. The artist volunteers often worked collaboratively and with the homeowners to express an idea, object or area. It is nearly impossible to accurately credit each contribution as they are so mixed together; the ideas, inspirations and actual hands-on work coming from many people and directions. You will find the key-contributors featured below, and in the book, House of Belief. Here are some of the original creative volunteers and Habitat homeowners from the Kansas City, Missouri pilot project. Thank you for all you contributed! Also, thanks to the many sponsors and partners. Over the years, literally hundreds volunteered, city-wide. Nearly 17 years since the beginning, you are not forgotten. From the bus-loads of school children, to the many small business donors, thank-you...over and over again. NOTE: See the stories in House of Belief: Creating Your Personal Style. This project is one of 12 beautiful stories and interiors for affluent and limited incomes alike. House of Belief is for all of us. P.S. Gloria, don't forget that pie recipe, I am looking forward to it, when we meet again. Thank-you to KC Magazine, for sharing the Design Gives Back story and mission. The team loves you! You are now an honorary Design Gives Back partner. Read the story here: THIS IS KC. Our "Design Hero" corporate partner for Charlie's MiracleMakeovertm is McCarthy Building Companies, Inc. Their Heart Hats Volunteers worked through rain, sleet and snow to make a family's dreams come true. The goal was to create a room for hope and healing for Charlie while in chemotherapy for brain tumors as a result of NF-1. It seems to have worked: Charlie made it through two rounds of chemo -- more than nine hard months -- while recuperating in his new room. The third round of chemo has now been cancelled! He is considered "stable." It is called a "miracle makeover" because we mean it. NOTE: If you would like to thank our kind sponsors please comment in the post just above. The comments are in the right corner. The new book The Architecture of Change: Building a Better World, is a must read for those desiring to change the world one brick, sofa or garden at a time. The book is a tour-de-force of those who have pioneered meaningful design and community environments over the past 20 years. A compilation of the late Kingsley Hammet's essays from Designer/builder magazine, you will find the inspired work of architects, designers, community organizers, gardeners, artists, chefs -- and others -- proving that creativity combined with heart, can change the world. "The call for change is everywhere, yet how to define it and how to achieve it remain vague. 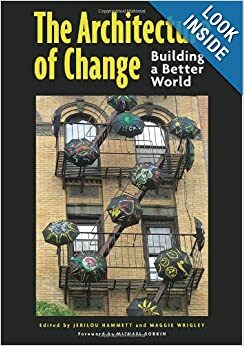 The Architecture of Change: Building a Better World is a unique book that documents how ordinary people have the power to transform their environments. It is a celebration of human diversity and a call for increased attention to our communities. This inspiring book explores the issues of equity, alternative forms of living, new concepts of urbanism, and the power of social networks." There are many types of design professionals endeavoring to "give back" these days. One of my long-time personal team members and true believers in the DGB mission is Dave Macaulay. Dave has edited books for me, advised and supported our work for the past 14 years. As an author of books on green or sustainable design, Dave's interests have included helping the world through better building practices. On his own, in 2007, he went charging down to New Orleans, like any good design hero, to see what he could do for the people and city after Hurricane Katrina, setting his sights on the hard-hit Lower 9th Ward. He then went on to co-found Historic Green, a sustainability initiative that has attracted hundreds of students and young professionals in architecture, engineering, construction, planning and design to help rebuild this community - through an unprecedented marriage of historic restoration and sustainable design practices. Read all about it and consider helping out here.